I've felt a little frustrated these last few weeks on the unpacking front. We accomplished alot last weekend in the garage organization, but now box after box awaits my attention. I can't do much of it on my own since I have to wait for Hubbs to be around to lift the heavy stuff. We've made so much headway, but then I look at what seems mountains, and it's easy for me to get overwhelmed. ...But then I open a box and it's full of small treasures. Each piece I unwrap tells a little story. Where it came from, when I found it, who gave it to me. These are small brooches from England that my husband gave me for Mother's Day a few years ago. 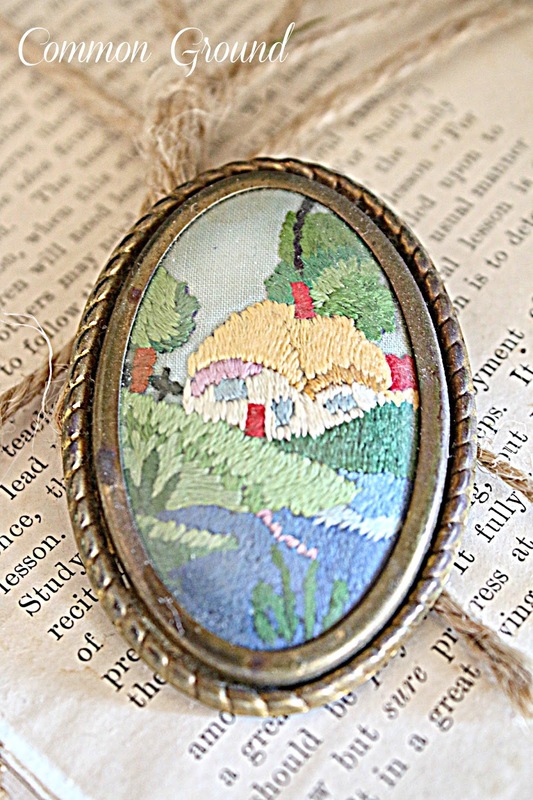 This one is a small cottage needlework piece that is under glass. This one is a porcelain piece. 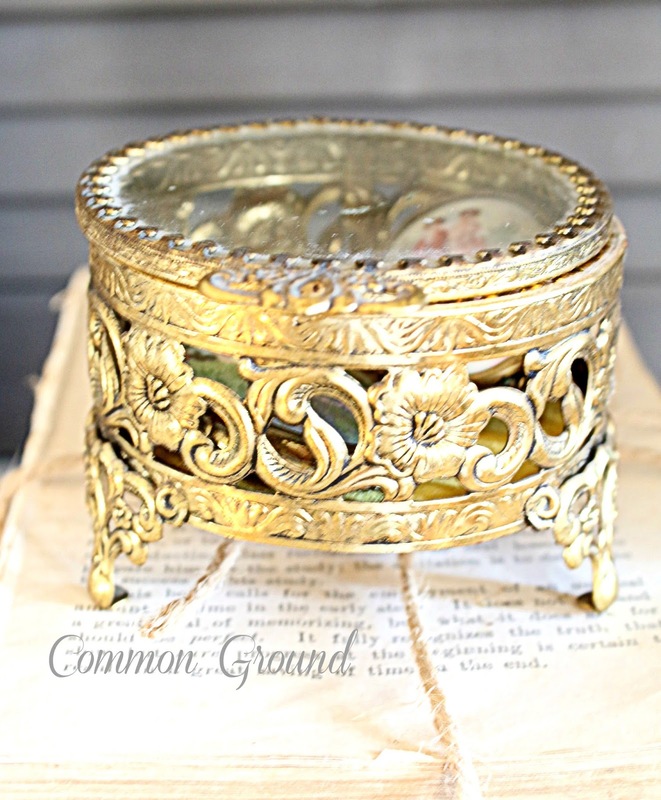 and I found them in this little brass jewelry casket. I can see them with new eyes. You must have had a LOT of stuff to take this long! But then I can't stand to have things around unopened. I wouldn't have room to walk! believe me, I couldn't have stood them to be underfoot, they've been in our storage units, in the garage, and in our storage room. Everything has been a process, and like dominos. I've just now been able to get to them. one thing at a time. I've had to be patient, (that's super hard for me) and yes, we've had a lot of stuff, much more than I wished we had. Hi Debra, I so know that feeling having just moved a short time ago. Looking at your treasure, oh my, what sweet blessings! Just take it easy Debra - remember Rome wasn't built in a day. It will all come together and now is the perfect time to purge things. 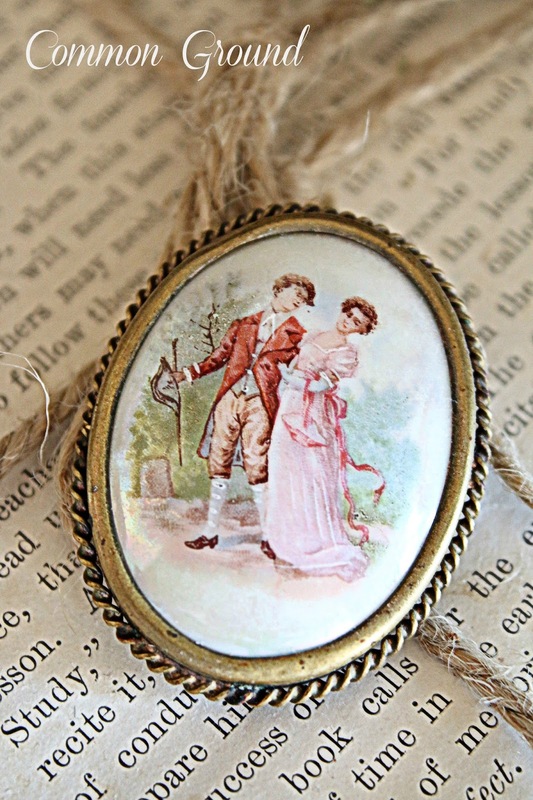 What precious treasures are these two small brooches from England, dear friend!!! You, dear friend, have taken a h u g e undertaking over the past year and a half!!! Closing up shop, literally. . .
moving into temporary quarters. . .
and the necessary renovations that make a new house your home! that place your "personal stamp" on your lovely home!!! Over time, the feel and look you're craving will evolve!!! Lovely treasures, and even lovelier attitude. Keep up the good work and take baby steps and try not to look at the whole. Oh don't feel bad about unopened boxes. It will soon be 3 years since we moved and I must confess there are still a few boxes full of my boys things stashed upstairs. Those little sweet things are beautiful! Very pretty pieces, Debra! Just take it one box at a time. I know it can be overwhelming but just keep that frame of mind. 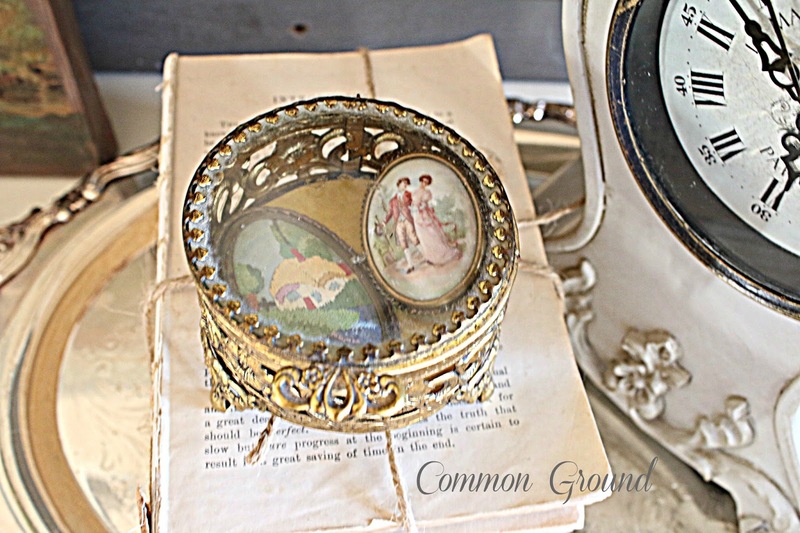 Isn't it fun to open up a box and peek inside to discover the treasures you packed away? We started packing last spring for our big move that will take place in the next few weeks. And I can't wait to start the unpacking. Can't even remember some of the things we used to have out on display. Exciting! Ooh, Debra, sweet treasures. I don't remember seeing those before! Oh it's difficult but don't loose heart. You have so many beautiful things. Love these brooches particularly the porcelain one. How much work must have gone into that sweet cottage. Moving can be stressful and getting everything unpacked is so time consuming. But the fun part is rediscovering all the wonderful treasure that has been packed away. You get to fall in love with it all over again! Take your time, small bites! That's a great way to look at it. 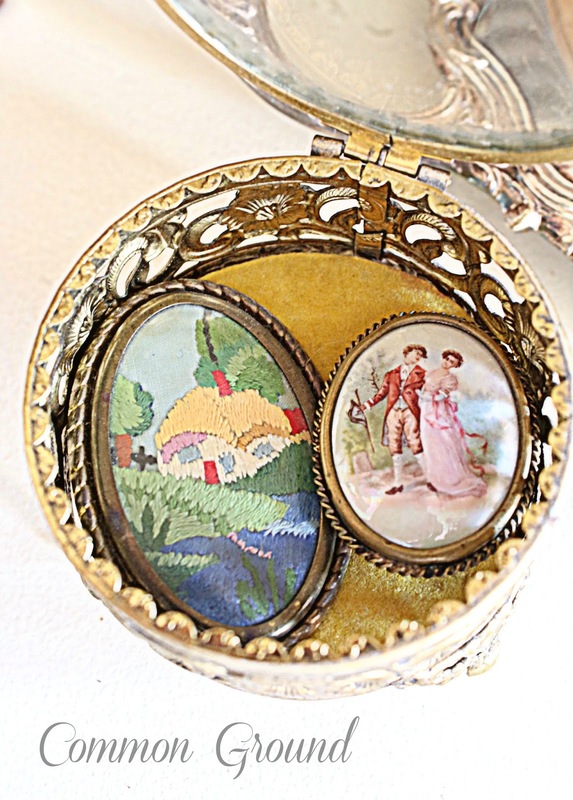 I love your little treasures tucked inside that brass box. I guess you should be glad that you have so much to choose from too. Better than the alternative! What a beautiful box to hold those very pretty gifts from your husband; such beautiful necklaces. They are real treasures. May you find many more treasures as you unpack. How absolutely special to have such precious treasures awaiting. How do we temporarily let those treasures slip our minds? Your treasures are so different and lovely, one of a kind. You must feel so special when you wear them. The brass container is beautiful also. We've moved a few times not just in same city but across country, whole new way of life. We moved from San Diego east county to 20 acres out on Canyon Ferry Lake south of Helena, MT, lived in our travel trailer at Marina til we could live on property. Months later we bought a single wide used trailer, then 2 yrs. later bought new dble wide. Lived in rv waiting for house to come in Jan/Feb/March. Then moved to Ky after 7 yrs. in MT. Lived in KY 5 yrs. now we live in western CO few miles west of Grand Junction, been here since August,2004 after living in rv again for almost 1 yr,, rented house for 1 yr. then bought our place in late July/2006. Believe me know how you feel. Moving is so unsettling, for months afterwards. When we moved from MT to KY we had our "stuff" stored for while waiting to find place to live. I lived out of coolers and one home made Hoosier for months. Before that we lived in our 24 ft.travel trailer at KOA in Bowling Green. After few months we bought new kitchen cupboards so they sat in boxes in dining room for almost year til hubs had time to hang them. He was on road a lot, trucker. He worked out of Missoula, MT so had to wait til they could get him home to KY.
Oh how I feel your pain. We moved nearly three years ago and we are still in our "temporary" house. Finding little treasures and thinking back on memories when you run into them though is such a gift. Good luck with your boxes. These are beautiful treasures, Debra. We expect to keep our storage units awhile longer. Even though I would love to bring everything here. We do drive up and pick up a few things at a time. Our new floors will be installed sometime next month. We hope to bring the furniture after that. Our youngest grandson, Noah (age 7), was here last week. He asked..."G'ma, when will you have a real living room?" That was a treasure for me. :-) We've had some of our storage units for a year. Others we've only had a couple of months, so we are still in the early stages of this little downsize transition. J is unable to lift much these days and neither am I, so we depend on our daughter who home schools Noah. She has a day during the week when she can help. That is much appreciated. Even after purging we still have quite a bit to go through again, when it gets here and we actually see what we need to keep. What a special and loving post. Memory ridden treasures. Even though it is overwhelming, I think it is like going treasure hunting when you open a box. Every Christmas I am always thrilled at what I find in the decorating boxes even though I open them every year. Debra, what beautiful little treasures! Kind of reminds me of Christmas. A surprise in each and every box. No hurry, just enjoy the journey and the memories! Thanks for sharing with SYC.